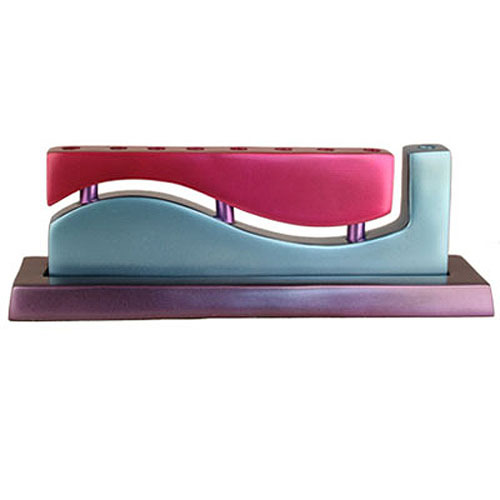 By Israeli artisan Yair Emanuel – a Hanukkah menorah shaped in a sleek, modern design. A rectangular base supports a menorah which is separated in to two wavy sections, connected by three pegs. Elegant and practical – this great piece of Israeli art and Israeli judaica is the perfect vessel for your Hanukkah candles. The Jewish festival of Hanukkah (also spelled Hannuka, and pronounced Chanukkah in Hebrew) is celebrated with a multitude of customs and traditions – spinning dreidels (tops), eating latkes (potato pancakes) and jelly doughnuts, exchanging Hanukkah gifts and receiving Hanukkah ‘gelt’ (monetary gifts). However, without a doubt the most prominent symbol of the Festival of Lights is the lighting of the Hanukkah menorah (also spelled menora, and known as a Hanukkiah, or Chanukkiah in Hebrew). On the first night one candle is lit, and on each following night another candle is added, until on the eighth and final night eight candles shine together in harmony. 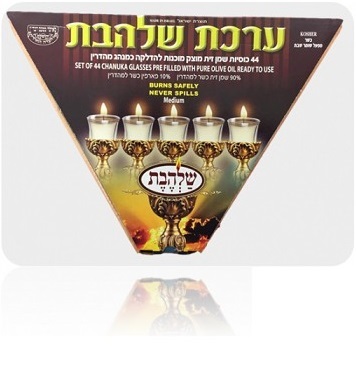 Each night, the regular candles are joined by the “shamash” (literally: helper) candle, which is used to light the other candles and is then displayed alongside them. Many families choose to add a touch of beauty and class to this age-old tradition by using lovely Hanukkah menorahs. Famed Israeli artisan, painter and designer Yair Emanuel has reached deep into his bag of tricks to once again produce a Hanukkah menorah that is fully practical, as well as aesthetically pleasing. A menorah divided into two parts is placed on a rectangular base. The edges of both parts are shaped in a stylish wavy fashion, to appear as though they were once connected and then separated by cutting in a wavy way. They are placed one above the other and connected by three pegs. The top of the upper part contains eight holes meant to house the Hanukkah candles, while the right side of the bottom part extends upwards, creating a home for the “shamash”. The simplicity and elegance of the design can fit any home, and the shiny light of the Hanukkah candles do nothing but compliment the design. 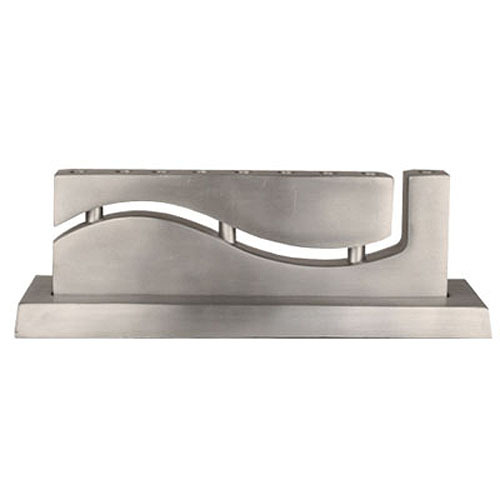 Silver – the homogenous color scheme highlights the curves and lines of the intricate shaping pattern. 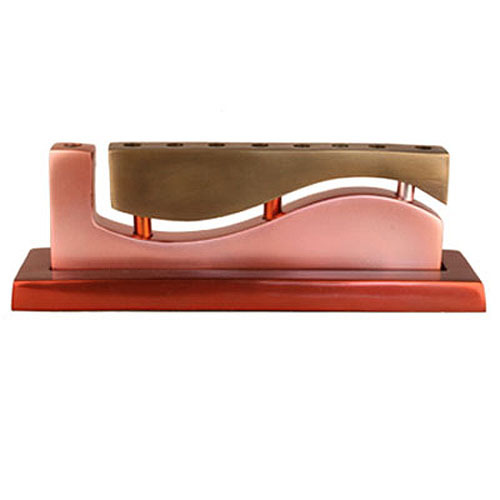 Gold-Salmon-Burnt Orange: The base is burnt orange, the lower part of the menorah is salmon colored, and the top part is golden. 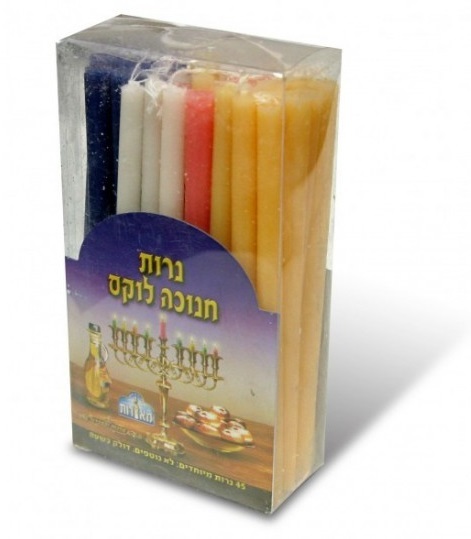 The elaborate contrast between the colors lends a colorful yet elegant touch to the menorah. 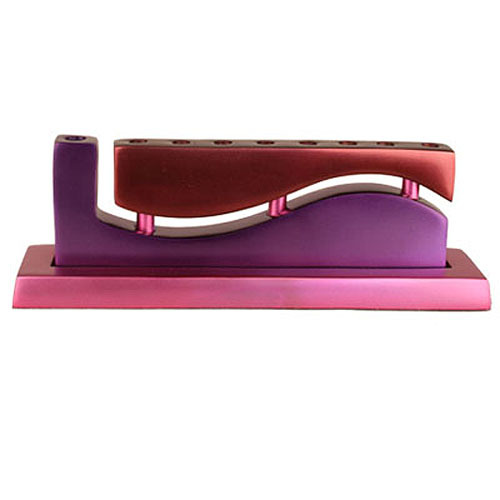 Red-Purple-Fushia – A more modern look, as the colors are progressively fashionable: A pink base, purple lower wave and maroon upper wave. Deep Blue-Violet-Seablue – The sea comes to mind in this dreamlike mixing of relaxing colors: A turquoise base, lavendar purple lower wave and navy blue upper wave. Magenta-SeaBlue-Violet – Two sea-colors are contrasted with a bright color, perhaps to show a calm background with a healthy splash of color: A purple base, sea-green lower wave and magneta-colored upper wave. This menorah measures 10” X 3.5” X 2.5”, and all colors (except for the natural silver color) are applied using an anodized coloring technique. Modern yet traditional, practical yet classy, this original piece of Israeli art and Israeli judaica is the perfect Hanukkah gift, or gift on the occasion of a Bar/Bat Mitzvah, graduation, anniversary or housewarming event.